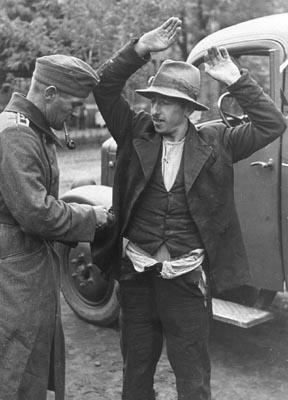 Holocaust Survivors: Photo Gallery - "German Soldier Searches a Civilian"
A German soldier searches a pocket of an arrested civilian who may be a Roma (Gypsy). His disheveled appearance suggests tha the was forced to pull his pants down to prove that he was not a Jew. The photograph was taken in Poland around 1940.